Pininfarina, the design and engineering company owned by the Mahindra group is exploring prospects to acquire companies in the US and Europe to expand its presence and speed up its growth. The Italy-based company has had a positive financial performance over the last few years with a growth rate close to 20 per cent. Pininfarina feels it has scope to grow at a much higher rate, and with the support of Mahindra, it could triple its growth in the next few years. While Pininfarina has strong presence in Europe, it has very limited reach in the US. The company is evaluating options to enter the American market by acquiring companies and increasing its market share. Currently, Pininfarina has close to 120 clients and it aims to achieve a target of 1,000 clients in three to four years. Pininfarina, who has shifted its focus to electrics, believes that it can do well in a market like the US, where the likes of Tesla have tasted massive success. The company today has close to 80 per cent of its business coming from the electric and hybrid segment, and it will look to tap the growing need for the design and development of electric vehicles in major markets. Tech Mahindra and Mahindra and Mahindra own 76 per cent stake in Pininfarina. This has helped it turn around in less than four years since being acquired in late 2015. Mahindra's recent advancement in electric technology and its presence in Formula E has fuelled the development for Pininfarina's electric vision. Mahindra also wholly owns Automobili Pininfarina, the vehicle manufacturing and sales company created out of Pininfarina AG. 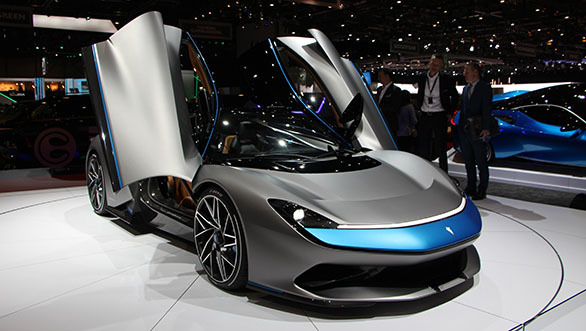 Automobili Pininfarina developed its first car, the Battista, also designed by Pininfarina AG, and received an extremely positive response when unveiled at the Geneva Motor Show earlier this month.